Each fall, our 11 Clubs celebrate Myra H. Kraft Opening Day to mark the first day Clubs open for the school year. On September 12, 2018, we celebrate our 11th Annual Myra H. Kraft Opening Day. 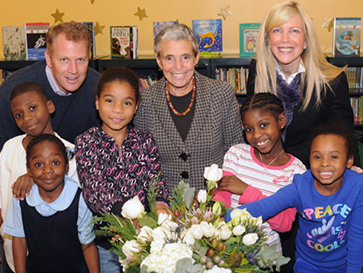 Read on to learn about Myra’s impact on Boys & Girls Clubs of Boston and why we continue to celebrate her legacy each year. In 1995, Myra H. Kraft became the first female Board Chair in the history of Boys & Girls Clubs of Boston. Myra wanted to focus her efforts on an organization that actively reached and engaged a broad audience of youth for substantial amounts of time each day. She supported BGCB because it shared her vision and belief in the impact supplemental programming can have—not only on the youth served but also on their communities as a whole. Myra’s work on behalf of BGCB was so meaningful and successful that the board changed the organization’s bylaws to allow the board chair to serve more than a four-year term. She stepped down in 2002 after seven years but continued to stay actively involved. Myra Kraft inspired everyone involved with BGCB through her unwavering dedication and generosity. Above all else, she loved children and delighted in visiting the Clubs to inter­act with members. Her thoughtfulness and compassion were matched by a passionate commitment to raising funds to sustain the organization, and her legacy will never be forgotten.